Publisher: Naval Inst Pr, Annapolis, Maryland, U.S.A. Here, for the first time in English, is an illuminating new German perspective on the decisive Blitzkrieg campaign of 1940. Karl-Heinz Frieser's account provides the definitive explanation for Germany's startling success and the equally surprising and rapid military collapse of France and Britain on the European continent. In a little over a month, Germany decisively defeated the Allies in battle, a task that had not been achieved in four years of brutal fighting during World War I. 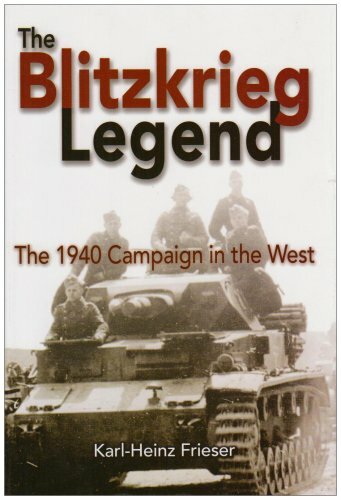 First published in 1995 as the official German history of the 1940 campaign in the west, the book goes beyond standard explanations to show that German victory was not inevitable and French defeat was not preordained. Contrary to the usual accounts of the campaign, Frieser illustrates that the military systems of both Germany and France were solid and that their campaign planning was sound. The key to victory or defeat, he argues, was the execution of operational plans - both preplanned and ad hoc - amid the eternal Clausewitzian combat factors of friction and the fog of war. Frieser shows why on the eve of the campaign the British and French leaders had good cause to be confident and why many German generals were understandably concerned that disaster was looming for them. This study explodes many of the myths concerning German Blitzkrieg warfare and the planning for the 1940 campaign. A groundbreaking new interpretation of a topic that has long interested students of military history, it is being published in cooperation with the Association of the U.S. Army. Karl-Heinz Frieser was a colonel in the Germany Army and head of the Department of World Wars I and II at the Military History Research Institute of the Bundeswehr in Potsdam. He is retired and lives in Germany.